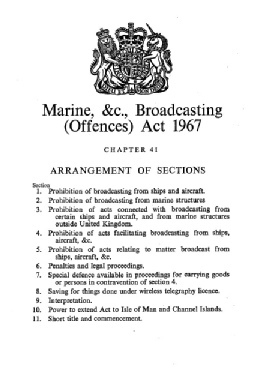 The Marine etc, Broadcasting (Offences) Act 1967 was the legislation introduced by the the n British Government, under the leadership of Harold Wilson,which was intended to close offshore radio stations operating off the coast of Britain. Successive governments had procrastinated in the introduction of such legislation since 1964 when Radio Caroline first took to the airwaves (and arguably even before that when the idea of offshore radio being established off the coast of Britain was first proposed by planned stations such as The Voice of Slough, GBOK, GBLN, and Project Atlanta). 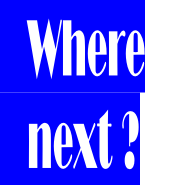 (b) the stations’ enormous popularity and the likely political backlash which would result from their closure causing problems for governments which at the time held only very slim majorities in Parliament. However, in 1966 an event took place which meant the Government could wait no longer - the hostile occupation of Radio City at Shivering Sands Fort and subsequent events which led to the shooting of the station’s owner Reg Calvert. Legislation was hurriedly drafted and passed through Parliament - a process which took 12 months to complete - and the Marine Offences Act became law at midnight on Monday 14th August 1967. (It was extended to cover the Isle of Man and the Channel Islands from midnight on 31st August 1967) . Simultaneously pressure was put on the BBC to find a way of providing a new pop music service to replace the output of the offshore stations and this ultimately resulted in the launch of Radio 1 six weeks after the Marine Offences Act came into force. Although most stations based on ships closed either before, or just as, the Marine Offences Act came into force Radio Caroline’s two stations remained on the air and defied the new law. Operating the stations was made more problematic in the months after the Marine Offences Act ‘s introduction, but both Radio Caroline stations - now known as Caroline International - bravely continued their output for over six months until other events took them off the air in March 1968. This Special Exhibition to mark the 50th Anniversary of the introduction of the Marine Offences Act charts, amongst other things, its passage through Parliament, the constitutional crisis it raised with the Isle of Man Government, the supporters groups which were formed to oppose the legislation and amendments which have considerably strengthened the original legislation. Most significantly though the original Act did not result in the end of offshore radio broadcasting off the British coast for over another 20 years !